Re: [Event] The Great CD Update Challenge! Oh gosh.... I can't remember the last time I drew Seaphira O_O It's been... oh dear, not sure I want to know.. 4 YEARS? ?? 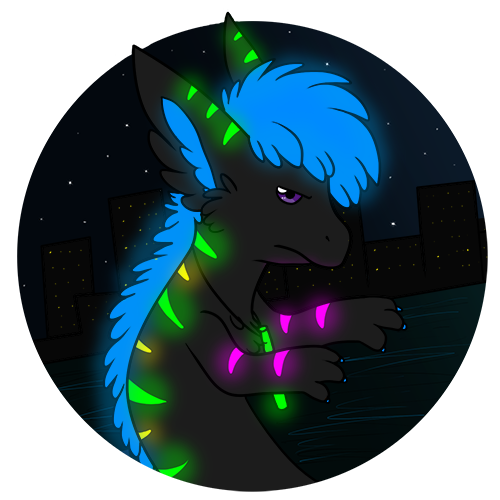 Xyriah is a smallish green dragon. She stands approximately 4 feet tall at the top of her head (around 2 1/2 feet at the shoulder), and is 7 feet long. Her overall build is comparable to that of a Great Dane- somewhat leggy, with a narrow chest and a lean muscular body type. 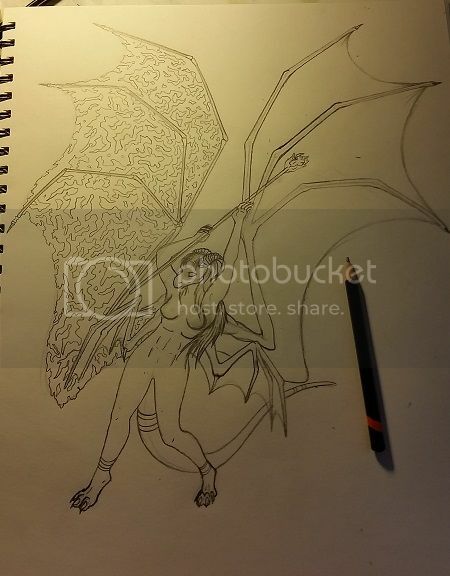 She's covered in small, iguana-like scales, except for her leathery wing membranes and scale-plated underbelly.
.: Xaradar : Flux : Corbyn : Mocha : Coral : Kai :.
.: Bailey : Sandy : Chopin : Phynion : Chiyoko : Arborion :.
.: Lanniah : Kline :. Dexter comes whirring back into the studio. "So, how's everybody doing? Descriptions coming along okay? We starting to think about palettes and sketching?" "Ooo!" Monte flags down the intern. "Sorry, I started a little out of order. I just - I noticed that my old ID was really old. I look so young in that picture!" "Nah, of course, man; that's what we're here to work on. Let's see what you've got." "Hey, this is good stuff here! Very helpful." Even more blushing!! "It's not finished." Obviously. He wasn't wearing pants! "See where we disagreed on how long my Tail's gotten? And she ran out of space for my other foot..."
"Yeah, but it's got your beard, your wing claw - this is nothing to sneer at! Why don't you and your portrait artist have a pow-wow about your physical description, and then go ahead and get your palette key started." Glancing over, Dex decided to have a word with this particular artist. Seems cropping out feet was a reoccurring problem for her. "Hey, these are supposed to be references. Not Math class margin doodles. Spiff it up please, ok? NO PLACEHOLDERS, PEOPLE! No "I'll get to this later"s. Today is your day! Make it count!" 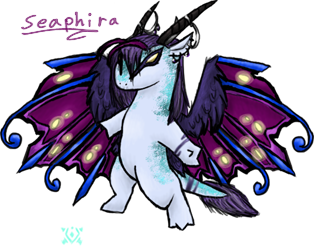 MidnightStar a lean and lanky western dragon with fore hands and hind paws, 5 fingered modified bat-like wings and curling ivory horns. His base color is midnight blue and navy with medium blue high-lights. 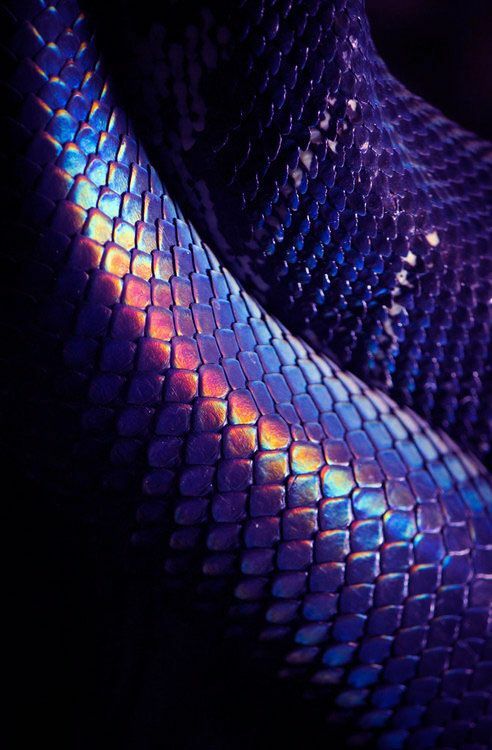 His small snake-like scales are reflective which in light may twinkle/shine like this. He has large, bright emerald green eyes with long lashes on his long horse-like face. Three long ivory jaw spikes line each side of his face. His bat-like triple layered webbed ears share connective tissue near the base of his ears. He has purple hair on his head with lighter lavender bangs. His long eastern-like whiskers are similar in color and are covered in curling purple hair that matches his goatee. 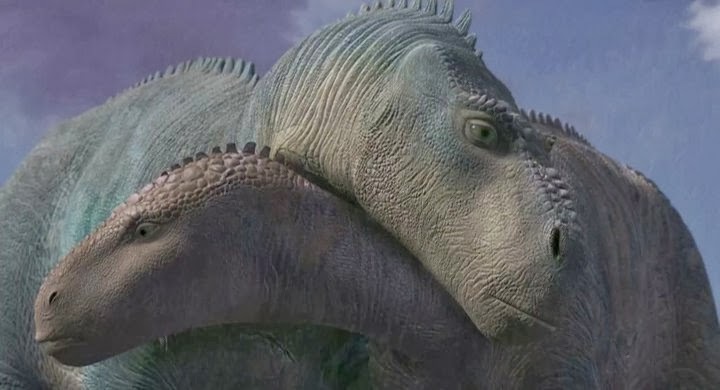 His back has long dark purple spikes that stick out from his vertebrae from the top of his neck to the base of his tail. His tail ends in a golden-yellow-yellow-orange 5 pointed star blade that the last point is elongated. The underside of the blade is flat while the top is slightly domed. His body is speckled with golden-yellow or white star and galaxy-like shapes. The underside webbing and belly scales start at the base of his throat are all light and pale goldenrod yellow. Oh, Marsi, you are a doll for sharing that chart! I've been in need of one of those for years XD! It doesn't have every color but it's got enough to work with. Instead.. going to do my first non-draik clan character (as far as age of CDs go) which is Xunithra. 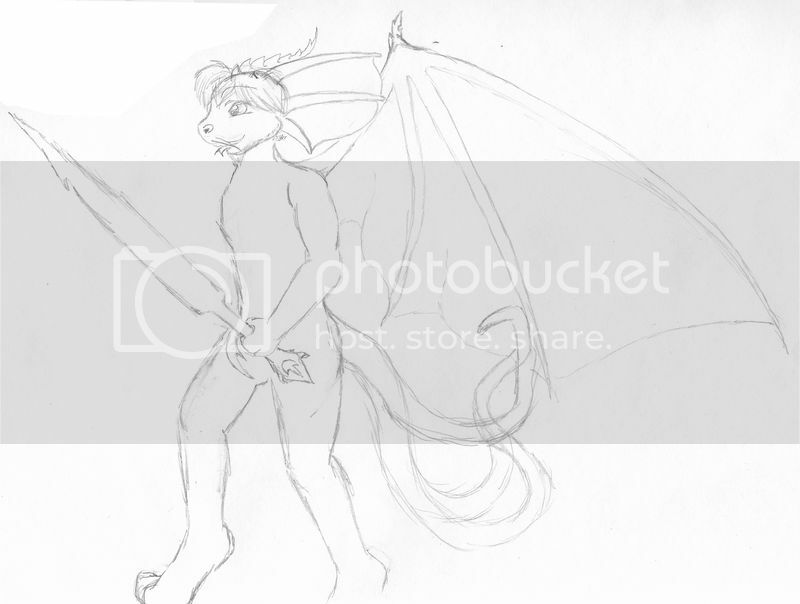 Two days left and I've been doing refs for everyone but Xyriah... Ardalu has one in progress, Sam has one in progress, Pyala has one in progress, as does the Pyali baby... I made a baby Nova ref... still no Xyriah. Oops. XD XD XD Posting here as a reminder that the month is almost over, maybe Xyriah will sneak out tomorrow... maybe. *makes L on forehead* That's right! L for Love! So since this is chronological, ironically, Dawnfire's reference is pretty great. Nothing about her has changed. She's always looked the same. But I do need to reword her ooooold CD. Dawnfire is coated with a soft fur that, since is water-proof, deflects rain off in droplets, much like a duck. 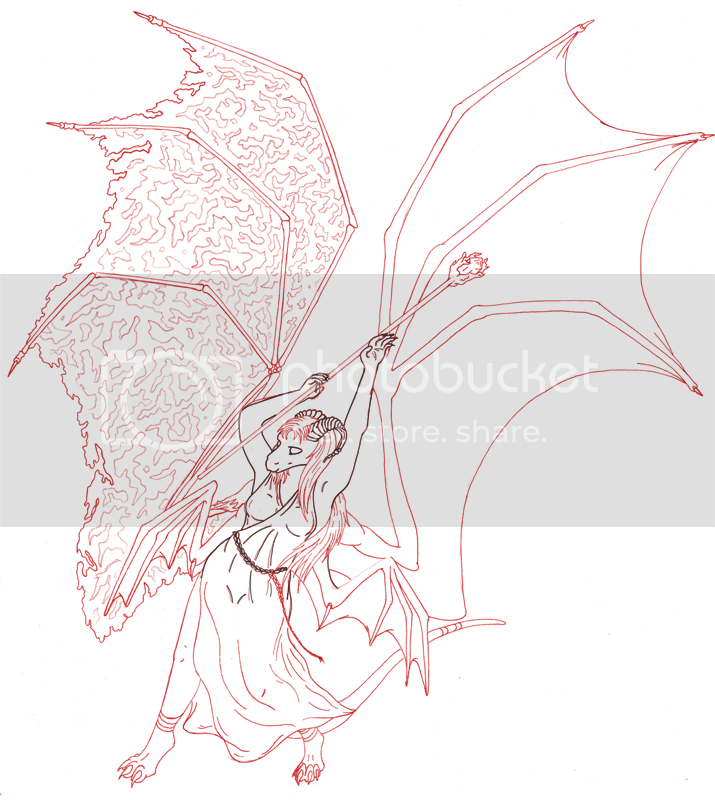 This enables her to fly in the rain and came about after she got her wings. 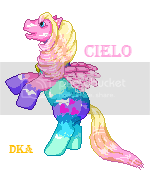 However, when her wings are withdrawn/retracted, for some reason her body reverts back to what it once was, and the oil can get washed away, and she'll be soaked clean through, just like any poor animal caught in a storm. Her coat is a more brilliant version of a sunrise (less warm greys and such). It's more befitting of a sunset. At any rate, her colors are said to mimic fire. She has 4 scales on her forehead that store her magic and sometimes acts as channeling points for said magic. They function like solar panels, as they draw energy from the sun. Oddly, they remain cool to the touch. 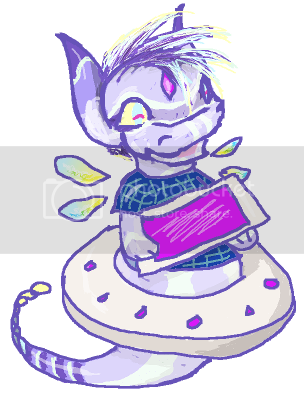 The hovering ball/gem near her tail is the main channeler for magic, though it does not allow that magic to radiate massive amounts of energy. The gem allows her tail blades to merge into a single one for combat if she chooses, and for having the blades disappear entirely, though she rarely does this. Somehow, it also enables her to retract her new-grown wings, which she has only done once in her life. A very painful process, and one she will likely not repeat. Her colors do not make the best camouflage, either. Most of that is weird. 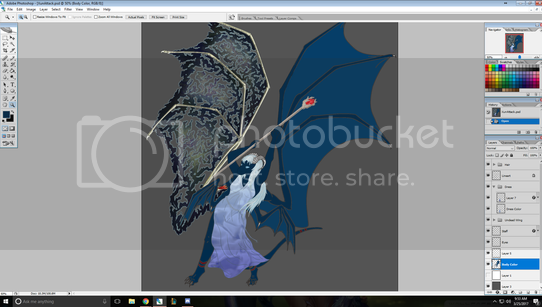 Mostly because I never picture Dawnfire flying, and a horse flying is just awkward and heavy the more I think about it. She does have retractable wings, but I never picture her with them showing. She's always galloping around and shouldering into things like a warhorse. The draft when running and the running into things would damage her wings quite a bit. ANATOMY: Dawnfire is built like a cheetah and a horse's lovechild. She has the long legs and leanness of a cheetah, but a horse's more rigid back, arched neck, and powerful chest and shoulders. Her shoulders and hips are wider like a horse's though her ribcage is thinner and not as barrel-shaped. Dawnfire's tail is catlike in its length and flexibility, though it is thicker at the base. It is not prehensile. Dawnfire is a little taller than an average Arabian horse, about 7 feet tall at the head, about 5'5" at the withers. FEATURES: Dawnfire has a blunt, squarish snout and a strong jaw and cheeks with a small mouth/smile. 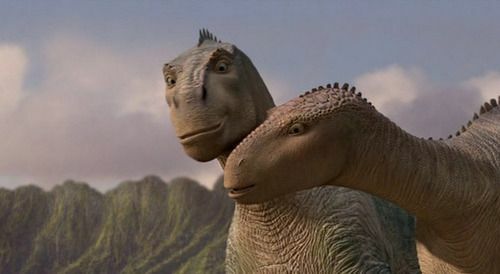 (A close head shape might be the Maiasaurs from Dinosaur. (one) (two). And Rain from Spirit: Stallion of the Cimmaron.) Her forehead to her nose is one broad straight slope. The rest of her body is elegant, tapering and graceful, and also mostly thin apart from her strong neck and chest. Her nostrils are large and circular. Dawnfire has a ridge of long crest feathers running from the top of her head to the nape of her neck. They have the tapered, pointed shape of primary feathers, stick up even when relaxed, and are arranged edge-to-edge like fence posts, not lying flat against each other like a stack of papers. She also has a shiny yellow ball hovering at her tail-tip (called a neri). It acts as a channel and focus for her magic and keeps her from radiating too much energy. Her glassy tail-blades hover like magnets around the neri, always retaining their overall flame-like shape. 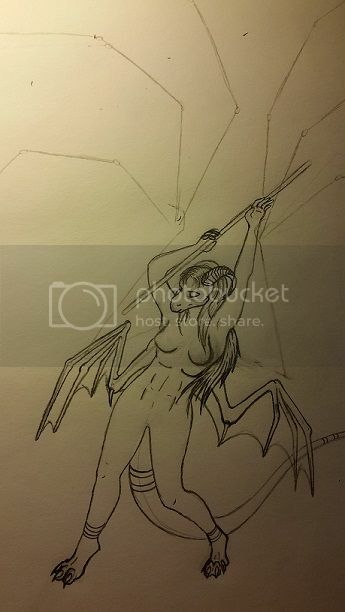 She has three blades, two large, one small, and best described via picture (I will make a tutorial on an easy way to draw them). Dawnfire has typical Yakusian feet-flames that are shaped like actual flames because she's a Fire Yakusain, though they move slower and faster in tune with her excitement levels. They cloak all four feet (which are cheetah-shaped). They are not true fire but an excess of magic so they don't burn (unless willed to) and the weaker she is, the less "fire" there will be. She also has four nose-scales that are thin, flat, glassy and transparent with a slightly pinkish hue that span the width of her snout. Colors representing her emotions will move through them, and they function like solar panels to draw extra energy in, though they remain cool to the touch. Dentition: She is an omnivore and has molars, canines, and incisors, but her mouth is very tiger-like, though her canines are relatively small. Non-constants: Dawnfire's wings are made of pure magic (they blossom when she comes of age) and therefore "retractable". More accurately, she can dispel them at will--think of the Fairy Godmother in Cinderella. Her claws are also retractable, but she keeps them out for grips while running, which keeps them blunted. TEXTURE: Dawnfire has short, velvety fur and soft flesh. Very horselike. 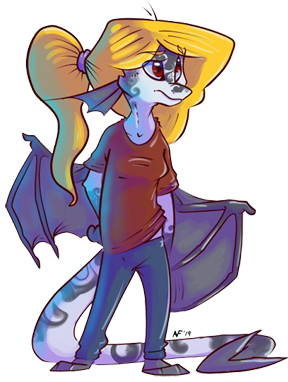 Her nose-scales, tail-blades, and neri are all cool, smooth, and glassy. TEMPERATURE: Dawnfire is slightly warmer than normal to the touch. She radiates more body heat in proportion to her anger or magic usage. Her wings, when showing, follow the same gradient--darkest at the longest feather-tips. Under the wings is paler yellow and the tops of the wings are more pink/peach. Dawn's nose-scales are a slightly pinkish hue apart from the colors of emotions that move through them. 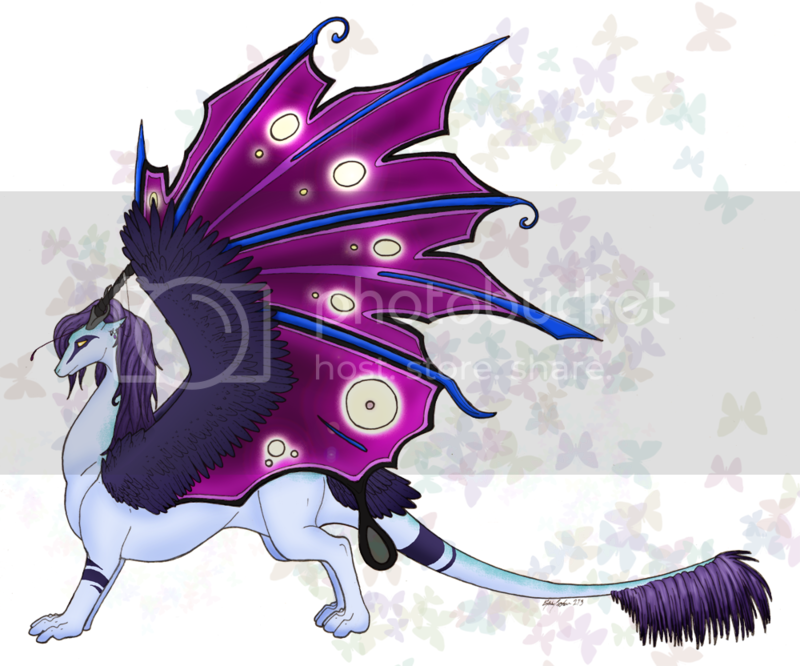 Her tail-blades radiate color from near the yellow-orange neri (floating ball) to the blade-tips moving from bright yellow to hot pink to violet, and at the very tips, black. Dawnfire's eyes are Caribbean blue. COMPOSITION: She is flesh (physical matter) built heavily from magic (energy)--specifically ether. She is so saturated with magic that the flow of it in her is like a spiritual respiratory and immune system. ---Pros: She can withstand a great deal of damage and adjust readily to different flows of energy (electric, temperature, barometric) or flesh-based needs (oxygen, nutrition). ---Cons: Her flesh can deteriorate and fail, so she can be weakened or killed by a voider (Chantage) or hijacking magic (Naja's human shapeshifting necklace). GAIT: Warhorse's arrogant stride. Dawnfire moves from her chest and neck. This gives her a confident stride and a bullish charge. She walks like a cheetah and runs in a horselike gallop. She keeps her chin up and head high, lending arrogance and authority to her movement, and when angry, her arched/hunched neck drives her posture. */** - Vices/Vessels who come up a lot, or will.